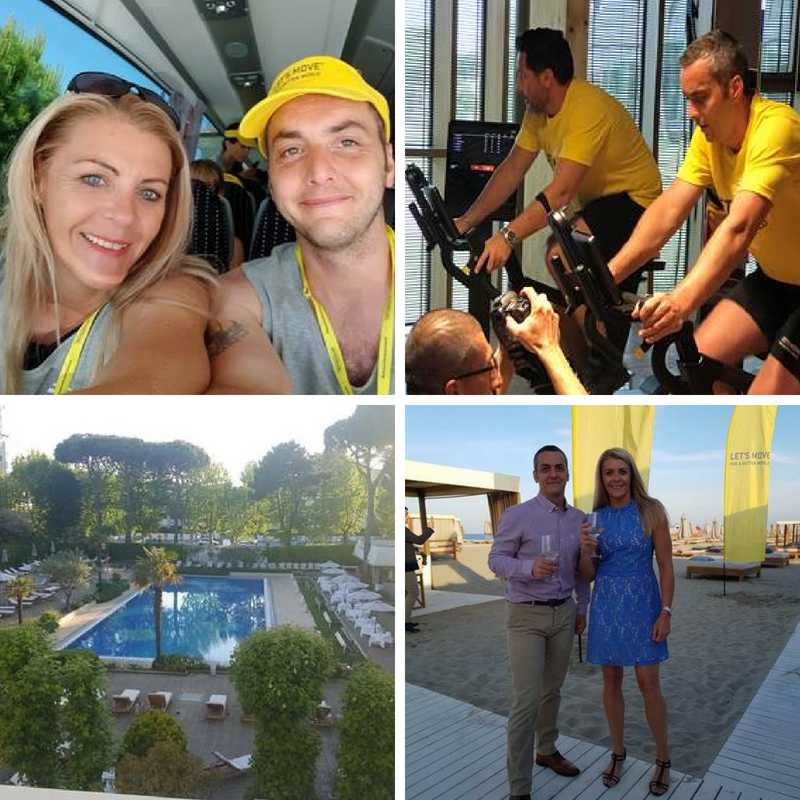 Recently two of our employees were invited to attend the annual Technogym Conference in Cesena in Italy at the Technogym Village. Wellness Manager, Natalie Westgate and Health Club Team Leader, Adrian Kalinski attended the conference which included 150 leisure operators from 10 countries. All had entered the Let’s Move for a Better World campaign back in March, where we retained our 3rd Place in the UK with an amazing team effort. We had very early flights from Heathrow departing to Bologna, this meant we travelled to London on the 19th May, the day of the big Royal Wedding! I suggested to Adrian that we went to Heathrow via Windsor so we could soak up some of the atmosphere. It was an early start from Preston and we arrived in a very sunny Windsor at 10:30am; just in time to see the ‘drive by’ with Meghan Markel! We watched the footage from large screens on the Long Walk at Windsor Castle and managed to secure a place at the road side when others had queued days before for their space! We still can’t believe our luck. The atmosphere was amazing and one I’ll never forget. You could hear a pin drop in the wait of anticipation as the ‘bride to be’ was approaching. So quiet considering the thousands of onlookers! When the National Anthem was played on the loud speakers and every flag from all different countries was being waved (included a green Ribby Hall Village one!) it was so emotional and gave me goose bumps! 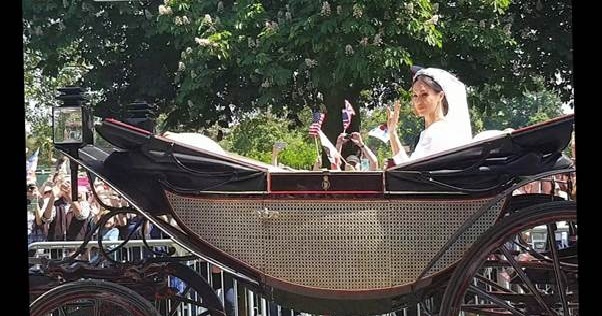 The video footage I took captured the horse drawn carriage ride perfectly of the happy newlyweds which we can cherish for many years and be proud to represent Ribby in this little piece of history. The day was wonderful and we had loads to share with the UK team that we met up with at Heathrow. We also enjoyed the morning complimentary papers on the BA flight and could sit back and see the professional pics! The day began arriving in Italy, checking into a 5 star hotel at the Mare Pineta Resort, with a welcome bag of Technogym sports kit! We were then whisked off to our surfing lesson on the beach; which was a challenge trying to catch a wave but so much fun! We headed back to the hotel for early cocktails at the beach bar and then onto our awards dinner where we collected our golden plaque for contributing to promote wellness on a global scale! Such an honour and the award is now displayed proudly at The Health Club. An early start with a tour of the Technogym Village and an all-day conference with keynote speakers, including the CEO and Founder of Technogym, Nerio Alessandri. There were many international speakers who were all extremely proud of us taking part in the Moves Event and believing in Technogym’s mission to promote wellness around the world. We also had time to try the new gym classes and equipment and a have a tour of the factory were the machines and equipment are made. The UK had the most participants in the Let’s Move challenge this year with 31,062 in total. I hadn’t realised just how well Ribby Hall Village had done and what we had achieved! At this point I was feeling very proud to be there and with the ratio of our active members and staff who joined in the challenge, we actually came 3rd in the world! We were then taken to an evening out in the local town to our own private restaurant and bar and had another delicious meal. Another early start for the next day back to the Wellness Village for seminars on the digital side of Technogym and discussions on new tech and the new equipment and ideas in the wellness world. After a fantastic few days it was time to head home. We learnt so much on this trip and we are excited to share everything with the rest of the team back at Ribby. We want to make sure we continue to offer industry leading wellness initiatives and health club facilities for our members, guests and staff. Time for the long journey back to Preston!